The last blog post reviewed how 3D printed medical devices present unique challenges from a biocompatibility assessment perspective due to their highly customized material properties. Additives to raw materials used in 3D printing are required to enhance workability. For 3D printed materials which are exposed to UV light and are cured, the details of the exposure and curing process can influence the chemical composition and other properties of the final material. This article will provide an overview of the chemistry involved in the exposure and curing of photopolymers (also known as photoresists), which is required to understand how these factors have the potential to impact the biocompatibility of the final structure. 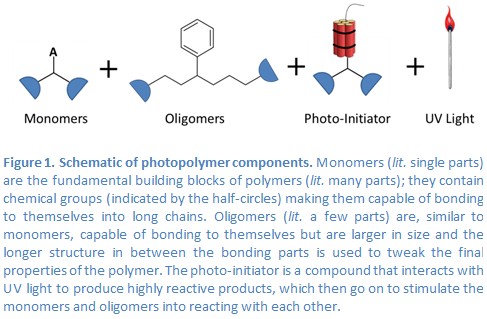 Photopolymers are composed of at least 4 critical components: monomers, oligomers, photo-initiator, and solvent (Figure 1). UV light is the activator, setting off a cascade of reactions that result in the polymerization of monomers and oligomers into a durable solid. Monomers and oligomers contain chemical groups that allow them to bond to themselves and each other into long chains. Monomers are the most basic single units of a polymer. Oligomers are larger and more complex than monomers, with chemical groups between the bonding ends that are tailored to customize and fine-tune the final material properties. Having monomers and oligomers with light-sensitive reactive groups would make them unstable and affect the polymer properties. Therefore, a photosensitive component is added which degrades in the presence of UV light to highly reactive radical products that activate the monomers and oligomers allowing them to join together. 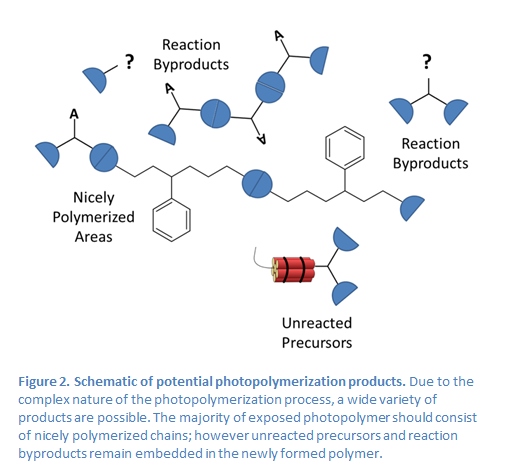 Photopolymerization is a complex process, where the balance of different chemical components, the intensity of UV light exposure, the duration of UV light exposure, and temperature are the critical variables. Much research has gone into the composition and balance of the different chemical components, so within the context of 3D printing this variable is highly optimized. The other factors, however, may be user defined and subject to evolution over time. The intensity of the UV light may change over the lifetime of the light source. Since the unexposed photopolymer absorbs UV light, the intensity also varies slightly over the thickness of the photoresist. The exposure time may depend on the write speed of the 3D print job. The temperature, which is potentially variable, is critical because this factor determines the mobility of the photopolymer components; higher temperatures allow reactants to move through the volume of the photoresist and polymer chains to readjust their positions. Even under the most ideal printing conditions, each of the reaction steps in the polymerization process proceed at different rates and never to 100% completion. Therefore, the result of the photopolymerization reactions are, at best, a well-formed polymer with traces of precursors, intermediates, and byproducts as contaminants. As conditions drift from ideal, the proportion of contaminants increases. The specific monomers, oligomers, photo-activators, and other additives used in the 3D printing of photopolymers are propriety and the types and proportions of potential contaminants are dependent on how ideal the printing conditions are. Therefore, under clinical conditions it is possible for a wide range of compounds to leach from a 3D printed photopolymer device, and the range of these is dependent on the curing parameters. In approaching the biocompatibility assessment of 3D printed photopolymer devices, these extractable/leachable compounds should be expected. Understanding the toxicological impact of these compounds requires expert review and evaluation on a case-by-case basis. Consideration should be given not only to the raw materials going into the printed photopolymer, but the details of the curing process which may be subject to process and environmental variability. Check back next week to learn more post-printing material rinsing and finishing processes.